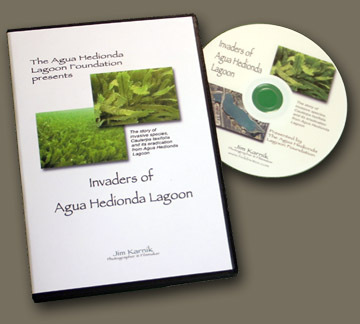 Produced for the Agua Hedionda Lagoon Foundation Invaders of Agua Hedionda Lagoon tells the story of how the introduction of non-native plant and animal species into sensitive natural systems, like California's coastal wetlands, can throw them off balance, pushing already sensitive species closer to the brink of extinction. One species in particular posed a tremendous threat to both Agua Hedionda Lagoon and the open coast of southern California. The highly invasive strain of the saltwater aquarium plant Caulerpa taxifolia was discovered in Agua Hedionda Lagoon in June 2000, where it was rapidly invading large areas of native habitat after its release from a saltwater aquarium. Upon its discovery, tremendous efforts were undertaken to eradicate Caulerpa taxifolia from the lagoon. The eventual success of the eradication effort was due primarily to the quick recognition that this invasive species could have devastating ecological impacts, leading to a rapid response to stop its spread. The high economic and biological expense of the invasion presented in Invaders of Agua Hedionda Lagoon highlights the critical role the public can play in preventing future infestations of non-native species, by NEVER releasing plants or animals into the wild. Executive producer - Merkel & Associates, Inc.